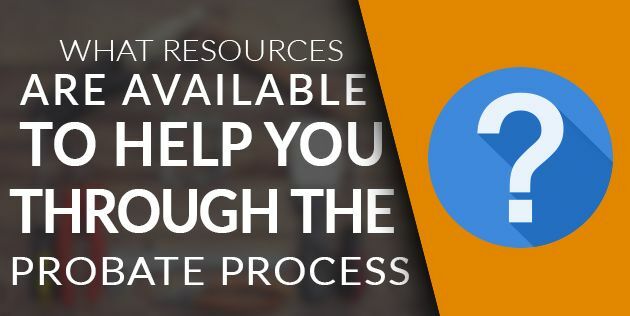 What Resources Are Available To Help Me Through the Probate Process? Home » Blog » What Resources Are Available To Help Me Through the Probate Process? This is probably the first and only time you’ll have to handle the probate process. It’s only natural to feel a little unsure about what you’re doing. There’s no shame in getting help. That’s why so many probate resources exist. Instead of biting off more than you can chew, try leaving some of the work to professionals who are qualified to take on certain jobs associated with the probate process. If the will of the deceased was unclear, or the deceased did not have a will, you’ll need to file probate paperwork in order to start the process. Nobody can do anything with the estate until an executor is appointed. If you’re looking to be the executor, you’ll have to petition the court. You’ll be able to find this paperwork online, or you can request it at the court house. You’ll also need to understand probate law in your state. Many states use Uniform Probate Code, though some states do things a little differently. You can read comprehensive information about probate law as it varies state to state on the internet. You may be able to start selling the home during the probate process. You’ll need to get the property appraised and set a minimum selling price with the help of the probate court. The real estate agent will focus on the promotion and sale of the property, though going this route means that the value added to the estate after the sale of the home will be less than you expect. You have to pay the realtor’s commission. If the probate property really needs work, you’ll have to hire contractors. Little things like repainting or changing outlet covers are simple enough to do on your own, but major work probably needs to be done by a pro. Old, stained carpet will need to be removed and replaced. New windows may need to be installed, and the roof may need to be fixed. If you don’t have the budget for that, you can sell the home the way you found it. After the estate has been settled, you’re going to need to do something with all of the personal belongings that have been left behind. Let family members decide which of the personal effects they want, and save the rest for an estate sale. If you don’t intend on selling any of it, you’ll still need to clear it out of the home and get it someplace where it can be safely stored. If you don’t want to pack it and haul it all yourself, you can always call a moving company for help. All you’ll need to do is supervise and provide instruction. Professional movers will be able to safely pack valuables, including fragile possessions, and transport them to their new destination. Figuring out all of the estate finances involves a lot of math. If you don’t know what you’re doing, you can easily wind up paying debts that didn’t need to be paid. If you want to know the total value of the estate and how much of that is owed out to creditors, an accountant will be able to get those numbers together for you. Settling the estate will be much smoother – there’s little room for mistakes this way. If you don’t want to deal with the court, you can always hire an probate attorney to handle things on your behalf. This is an expensive route, but if you can afford it, it will save you a lot of time. If you and your family just want some time to process your emotions, perhaps you could all chip in a little for an attorney to act in your stead. We accumulate a lot of junk, especially if we’ve been living in the same place for a while. Your probate property may be crowded. The stuff you aren’t keeping, or any garbage lying around the yard, is going to need to be taken care of. Clean up crews can haul off things like old or broken furniture, defunct appliances, and other large items that would otherwise be difficult to move. Where are you going to put all the stuff you want to keep, but don’t have a place for? A storage unit is a good temporary solution. Though they’re expensive in the long term, they’re a good layover for important items, like pieces of furniture or antiques, that need safe keeping before they’ve found a permanent new home. If you’re looking to sell your probate property quickly, an investor is a valuable alternative to a realtor. The advantage of working with an investor is that, even though you’ll likely be offered less than what the home is worth, you’ll probably be adding more money to the estate this way. Investors will buy homes regardless of the condition that they’re in, so you won’t have to pay to fix anything. Investors also don’t take commission or closing fees that cut into the profit from the sale of the home. If you’re having trouble unloading the property due to damage, a slow housing market, or a lack of time, SCHB may be able to help. Send us the info about your probate property, and we’re prepared to draw up a fast cash offer. If you don’t want to drag out the process, we’re here to keep things quick and simple. Spend more time with your family, and less time worrying about what to do with your probate property. « Previous Post What Are My Options When My Probate Property is In Bad Shape? Next Post » What Should I Do As The Administrator During The Probate Process?